Not surprisingly, given the rash of ho-hum economic reports we’ve seen recently, the Job Openings and Labor Turnover Survey (JOLTS) for April 2016 was underwhelming. On the plus side, job openings ticked up slightly as layoffs fell. On the downside, the hires rate has fallen precipitously two months in a row, while the quits rate ticked down slightly. The figure below shows the dynamics of the key top-line numbers. The positive news on layoffs is clear. The layoffs rate—the number of layoffs as a share of total employment—is now down to 1.1, better than the rate over the last entire business cycle, 2000-2007, when its trough was 1.2. That’s great news. 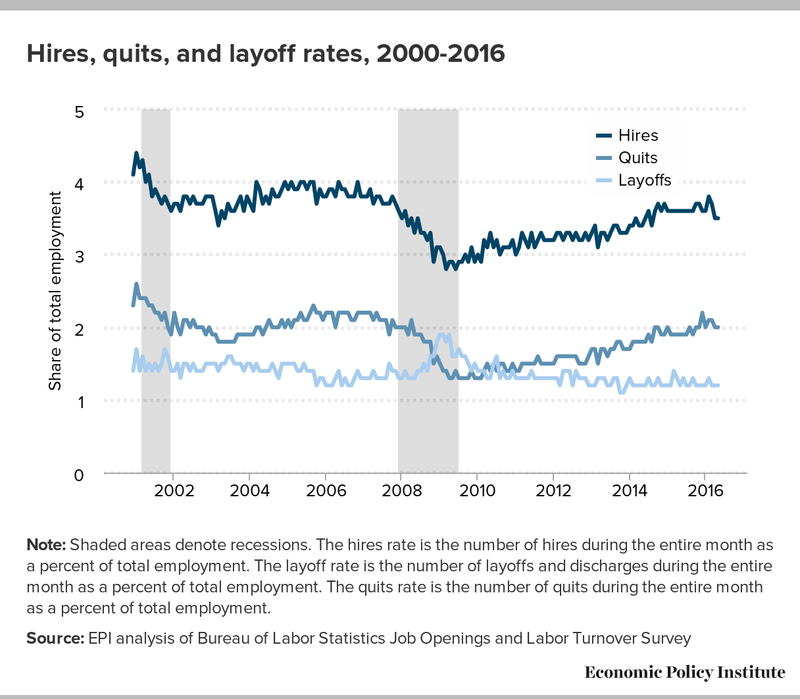 Unfortunately, hires and quits remain below full employment levels—hires peaked at 4.0 in 2006 and 4.4 in 2001, while quits peaked at 2.2 in 2006 and 2.6 in 2001. It is particularly troubling that the hires rate has fallen for two months running, from 3.8 in February down to 3.5 in April, but it’s not surprising given the weak Employment Report for April. Unfortunately, the even weaker Employment Report for May suggests that hires may fall even further when the JOLTS report comes out in July. While increasing job openings is a good thing, it needs to translate into hires for workers to see the effects of that increase. The quits rate fell slightly in April from 2.1 to 2.0. In a stronger economy, workers would feel more confidence to quit their job in search of a better one. For many years now, workers have continually stayed in their job rather than finding what might be a better match. Some workers are clearly having an easier time of the recovery than others. 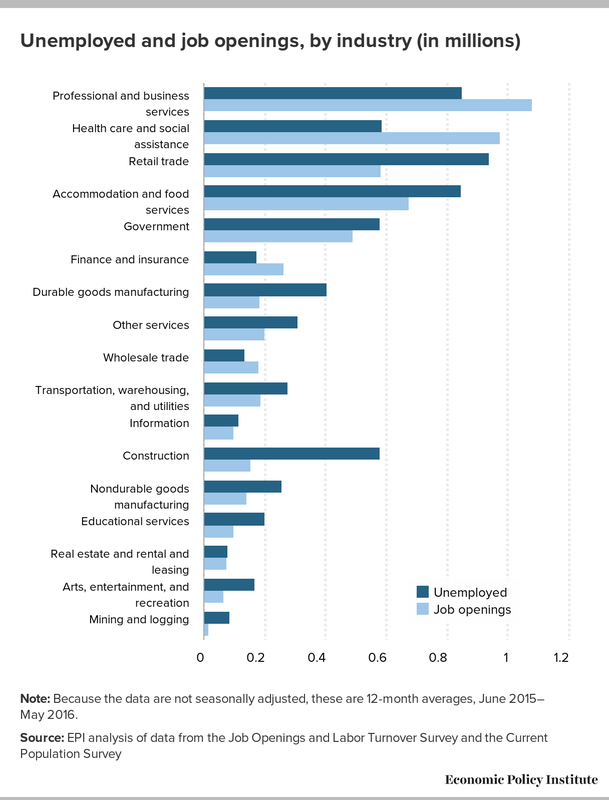 As the chart below shows, unemployed workers in some sectors are seeing more job openings than others. Job openings exceed the number of unemployed workers in professional and business services, health care and social assistance, finance and insurance, and in wholesale trade. On the other hand, unemployed construction workers continue to face a weak job market. There are 38 unemployed construction workers for every 10 construction job openings. While some employers claim skills shortfalls, increasing wages, offering on-the-job training, and more intensive search techniques would most likely close those gaps. Note: Because the data are not seasonally adjusted, these are 12-month averages, June 2015–May 2016.